In early January, PGCB completed their 15+ km double circuit 132 kV Haripur- Bhulta reconductor project using 416.2 mm^2 Grosbeak size ACCC Conductor. The Government of the People’s Republic of Bangladesh received a loan from World Bank towards the cost of Enhancement of Capacity of Grid Substations and Transmission Lines for Rural Electrification under the Rural Electricity Transmission and Distribution (T&D) Project. 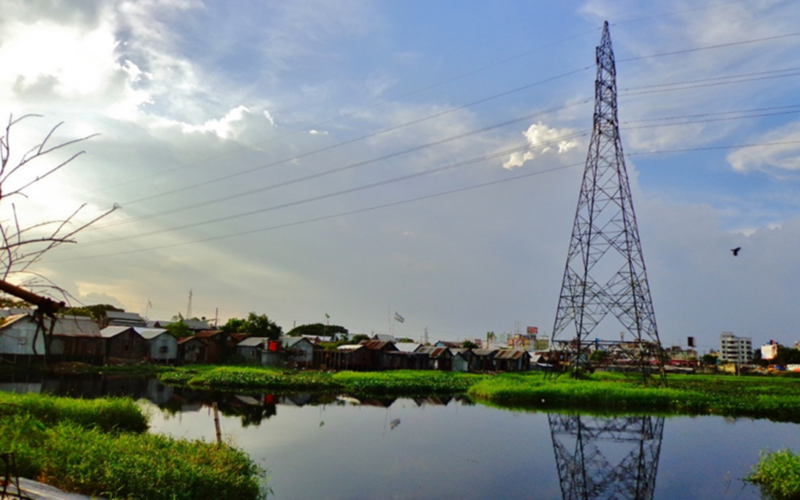 Power Grid Company of Bangladesh Limited (PGCB), one of the implementing agencies of the project, applied part of the proceeds to fund this project. Bhulta is close to the large Baburhat & Madhobdi wholesale textile market and Haripur is on the bank of the Sitalakhya river across from the Sidhirganj industrial area and power plants, an hour’s drive from Dhaka. Existing lattice structures were reused without modification with spans ranging from 150 to over 400 meters in length. 7.5 kilometers of the project was completed in wetlands, while 2.5 kilometers was completed in highly populated areas that included a major highway crossing. HG Power Transmission served as an EPC and they were supported by CTC Global’s Regional Service Manager, Samudi Sampangi and ACCC Master Installer Mr. Balaji of TEEMS India. The ACCC conductor for this project was provided by Midal and hardware was provided by Dervaux. The installation team used Omac Pullers & Tesmec Tensioners and neoprene lined sheave wheels. This project is the 10th ACCC conductor installation completed by PGCB in Bangladesh, with over 1,400 kilometers installed. Other ACCC conductor projects are currently underway in Bangladesh. What was cost of reconductoring ? Reconductoring with ACCC conductor is generally much less expensive than installing new larger structures to support larger, heavier conventional conductors. Please contact me at info@ctcglobal.com for more information. Thank you.